Native Instruments' new hardware offering has a few unusual features that may just find it a niche in the crowded audio interface market. The Audio Kontrol 1 is a two-in, four-out audio and MIDI USB 2.0 interface, with the added bonus of several programmable MIDI controllers, and with the same attractive solid metal and glossy black plastic physical design as NI's Kore. A fold-out poster in the box provides diagrams of various configurations to help you get set up. The four examples also give you an idea who the AK1 was designed for: Keyboard/Studio, Guitar/Bass, DJ'ing (Internal Mixer), and DJ'ing (External Mixer). A CD installs the drivers, controller setup utility and enough bundled software to get a first-timer up and running in any of the suggested scenarios (but Intel Mac owners should check out the 'Bundled Software' box). On-line authorisation (which is required to use the setup software as well as the bundle) went smoothly for me, via NI's standard Service Center utility. The Audio Kontrol 1 software is configured by the installer to launch whenever you boot your computer. Although this feels a bit intrusive, it's done because the software needs to be running to use some of the advanced controller functionality. A preference in the application allows you to disable this auto-launching behaviour. Live, Reason, and Kore all recognised the AK1 as an audio device straight away, with access to the usual settings, such as sample rate (up to 192kHz), latency and channel selections. The unit also happily co-existed with a Kore controller, and I was even able to use the I/O of both devices simultaneously by creating an Aggregate Device in the Apple Audio MIDI Setup utility. At first, however, a constant crackling appeared in the audio outputs of both devices. A driver update provided by NI almost entirely cleared this up, with just very occasional small clicks. Used on its own, the Audio Kontrol's output is clean as a whistle. Thanks to the bandwidth of USB 2.0, the Audio Kontrol 1 can work at sample rates of up to 192kHz, although this will, of course, quadruple your CPU overhead. Like most users probably will, I ran at the standard 44.1kHz, apart from a few tests, and was surprised by the results. The audio quality, both for recording and monitoring, is excellent. I regularly monitor from the outputs of a Digidesign M Box 1, an M-Audio Quattro and Kore's audio outs, and the AK1's output sounded easily the best, with an obvious increase in clarity and depth. One of the reasons for this was that it's the only USB interface I've used that completely cleans up the interference that some G5 towers (including mine) have a habit of imparting to audio signals. There are four main outputs on the rear panel, with quarter-inch balanced jack connections, plus a quarter-inch headphone output on the front panel. Two front-panel knobs control the output level of channels 1/2 and 3/4, and there is a separate phones level knob. A toggle button lets you switch the phones between monitoring outputs 1/2 and 3/4, a major advantage for live and DJ work. This functionality worked nicely with the mixer cueing system in Traktor LE, with no configuration necessary. Another button switches in a direct (no latency) monitoring mode, which routes the input signals straight to the outputs. The Monitor knob sets the level of this signal. The direct monitor signal can be fed to either pair of outputs, but this can only be switched in the setup utility. An LED on the top panel shows which outputs are currently selected for direct monitoring, when active. On the input side, there are two connections that appear on the front panel: one multi-format connection for XLR mic or quarter-inch balanced line input, and one quarter-inch port for balanced line or instrument (guitar) input. A button switches Input 1 between mic and line modes, and another button switches Input 2 between line and instrument. Two knobs control the gain of the preamps, depending on the state of the switches. The mic gain knob controls the level of input 1 if it's in mic mode, while the line knob sets the gain for both inputs when they are in line mode, allowing for both inputs to be linked when recording stereo line-level devices. This design is efficient and easy to use, and will cover most of the target users' needs, but doesn't allow for stereo mic recording. Phantom power can be provided to a mic, with the switch tucked away on the back of the unit. Luckily, an LED on the top panel indicates whether phantom power is on. Metering conisists of single LEDs, which light green when a signal is present and turn red at clipping. Further LEDs indicate USB connection, MIDI activity and monitor routing. One small observation is that the LEDs are green, while the box and promotional photos show them as red. 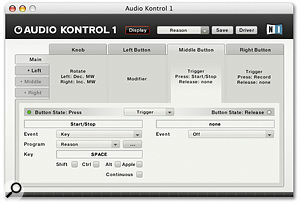 The Audio Kontrol 1 comes with three software packages, each aimed at one of the applications NI imagine the interface will be used for. For aspiring laptop DJs, there's Traktor LE, the 'lite' version of NI's virtual decks and mixer environment. LE has all the basic functionality of the full version, but is limited to two decks, a cut-down two-channel mixer and basic effects. For the guitarist aiming to plug straight into AK1's instrument input, there's Guitar Combos, which offers three preset amp and cab combos from Guitar Rig. There's the AC Box Combo, Plexi Combo and Twang Combo, all offering enough controls and built-in effects to keep you going. Finally, Xpress Keyboards offers versions of the B4, FM7 and Pro 53 synth plug-ins, with limited programmability. Each instrument is limited to eight controls, which are mainly used to alter the presets. These are all very useful packages, especially if you don't already have any equivalent software, but there is one problem: Xpress Keyboards and Guitar Combos are not compatible with Intel Macs. NI plan to update Guitar Combos, but Xpress Keyboards is not slated to receive further development (a fact which may also affect Windows Vista adopters). My first reaction to the AK1's MIDI controls was 'why?'. There is a single knob and three buttons, surrounded by red lights when active, whose inclusion I regarded as a rather empty gesture when the product was announced. However, I warmed to them as I discovered that they can serve some rather unusual purposes, compared to your typical assignable MIDI controls. They can be used as regular MIDI controllers, either by using your software's MIDI learn functionality, or assigning specific messages to the hardware. The AK1 is not (yet) profiled in Reason or Live, so can't be used as a 'roving' controller: you have to make dedicated assignments. However, this is not the best way to use the controllers, which don't really lend themselves to controlling instruments anyway. More usefully, the AK1 can control software at the application level by sending key commands. Making particularly cunning use of its one knob and three buttons, the Audio Kontrol 1 offers a surprising amount of hands-on control. 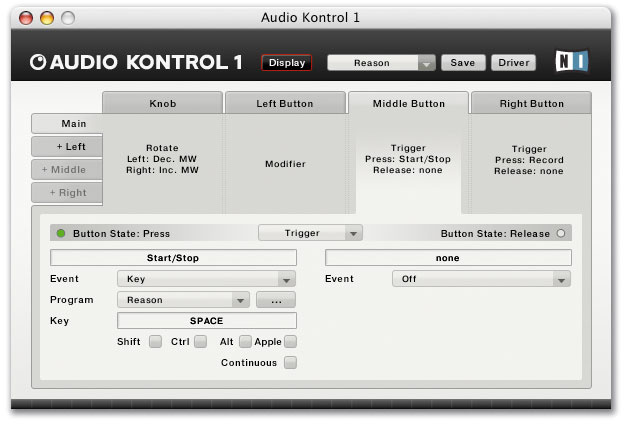 Assignments are managed through this simple interface page.For the user to access the extended functionality, the Audio Kontrol 1 software must be running, so that it can translate the controls to the approprate commands in the background. A long list of presets is available in the utility, mostly for NI software, but also for all the other big music programs. A number of other programs also have command sets, such as iTunes, Garageband, Final Cut Pro, and even Photoshop! For example, in Reason, the middle button acts as a play/stop button, and the right button as a record control. The screen below shows the Assignment page for the middle button in the setup utility. The middle button has been assigned to mimic the Space key, instead of sending a MIDI command, and the command has been assigned to Reason. The Program parameter lists all currently open applications, and you can assign buttons to any keyboard shortcut, including those combined with modifier keys. Commands can be declared continuous for functions that act while the button is held down, and you can trigger commands on both press and release of the button. This is very powerful, and as an experiment I was even able to set up a control page for playing Tetris with just the AK1! I can't wait to see this technology appear on devices with more controls, but even the AK1's small panel becomes useful as a transport control, volume control and so forth. A further level of ingenuity is shown in the concept of control 'layers'. Any AK1 control can be assigned different functions when used in combination with another. The control page for the bundled Traktor LE is a good example. On its own, the main rotary control adjusts Traktor 's master volume, but if you hold down the left button and rotate the knob, it adjusts the pitch of Deck A. Combined with the middle button, the knob controls the Crossfader, and so on. The buttons can also be combined with each other. For example, holding the left button and pressing the middle button starts Deck A. Different commands are accessed depending on which button you hold first. In all, up to 10 functions are accessible from three buttons and one knob. As a four-channel audio interface, the Audio Kontrol 1 might seem a bit pricey, but for the extra money you get audio quality that is significantly better than any USB interface I've used. The four outputs, monitor switching and rugged construction make the AK1 a good choice for DJs and live performers, and the buttons and knobs are probably at their most useful in this situation. Guitarists will be drawn by the instrument input, Guitar Combos software (see box above), and the ability to switch virtual amp settings from the buttons, but if the guitar is your main instrument you will probably want to stretch to Guitar Rig 2 with the Rig Kontrol instead, as there's no footswitch input. The ability to map the buttons and rotary control to any application's key commands is ingenious, and makes the controller side of the Audio Kontrol 1 much more useful than I'd imagined. What makes it slightly less attractive as a controller is that with input cables on the front panel it's untidy on your desktop. However, overall the Audio Kontrol 1 is a class act, and the audio quality feels like a touch of luxury compared to my regular portable system. Separate headphone out with source switch. Controller system with key command mapping. In the studio, using the controller means cables on the desktop. Some of the software bundle is incompatible with Intel Macs. 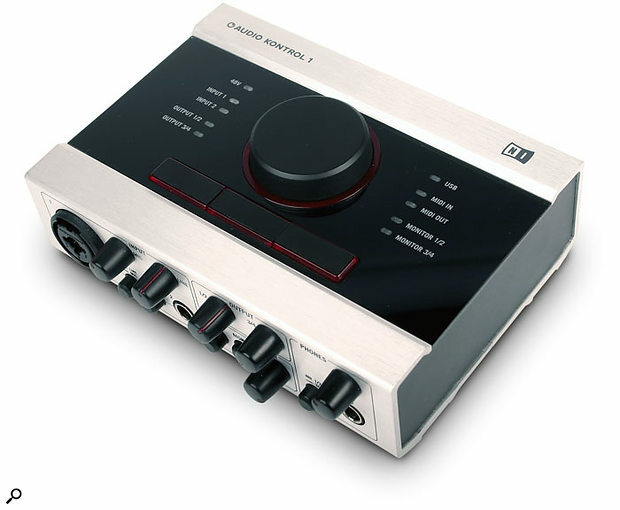 A classy USB 2.0 audio interface with sample rates of up to 192kHz, MIDI In/Out and an innovative controller system. The Audio Kontrol 1 offers superb audio quality and is ideal for live and DJ work, as well as for the desktop studio.